The White Water Walk is a few kilometers north (downstream) of the Falls. 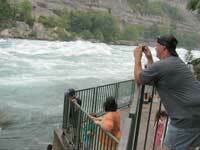 It is found behind the international entrance to Canada at the Whirlpool Bridge. Downstream from the Falls, the water rushes through the gorge at its narrowest point. 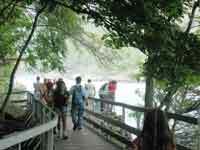 Stroll along a boardwalk alongside the relentless torrrent of wild white water but a few feet away. Check out the eroding remains of the Great Gorge Scenic Railway. It used to ferry people around the gorge. Dates of Operation: Open Seasonally, daily between April 6 and October 28. Hours of Operation: All times subject to change. Last tickets sold 30 minutes prior to closing time. Facilities: Birding, partial wheelchair access, washrooms, shopping.